Despite Sweden being considered one of the most secular countries in the world, religion still plays a big part in many of the holidays. Honestly, I think Swedes will embrace just about any reason to take a day off work or, in the case of today, eat pastries. 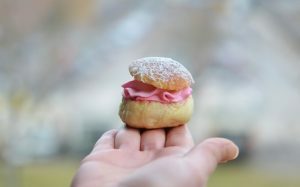 And perhaps king among them is the mighty semla (plural semlor) – a sweet bun filled with marzipan and whipped cream, and dusted with powdered sugar. Oh, sure, the cinnamon bun might actually top the charts as most popular baked good, but that’s probably because it’s eaten year-round. Semlor are traditionally eaten on Fat Tuesday as part of the feast before the fast, but many will also eat them in the weeks before and after. So, it’s limited availability seems to generate a bit of a frenzy when they start popping up in bakeries and stores. I know, I worked in a bakery some years back. The amount of semlor we produced was insane. Extra people had to be hired who did nothing but pack the creamy buns in boxes all night. Cinnamon Bun Day (yes, that’s an actual thing) never created that kind of demand. The word “semla” comes from the latin word for flour, simila. Eating semlor in Sweden dates back to the Middle Ages, though the buns were made in the shape of a cross and without the fillings. Apparently, the first documented semla is found in a painting from 1250 that hangs in a Danish church. I’ve seen this cited across numerous sources, yet can’t find a single picture of said painting, or any reference of which church it is in. Urban legend? Maybe I need go on a Danish church road trip… for science! Mini semlor means you can eat more of them. Anyway, around the 1700s marzipan was added to the buns. Then, in the 1800s, the cream. People also began eating them in a bowl of warm milk around this time—which is still done today. It wasn’t until the 1900s, though, that people got crazy and started eating them in-hand, which, given the amounts of cream, is impressive. I generally don’t see people eating them this way, though, unless the buns are wee. Yet all is not rosy in the world of semlor. 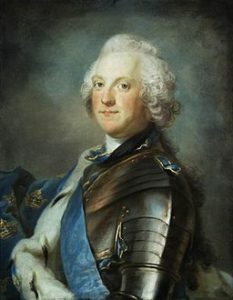 In 1771, King Adolf Fredrik died after eating a hefty meal of lobster, caviar, sauerkraut, kippers and champagne, followed by an impressive dessert of fourteen semlor. Fourteen. I hope they were wee, because that’s just crazy. I don’t consider myself a religious person, and I never observed Fat Tuesday until I moved here. Which, given how secular this country is, is kind of ironic. But I find myself agreeing with the Swedes: any reason to eat pastry is a good one, right? Right. Do you observe Fat Tuesday? I’ve never heard of a semla, but it sounds rather tasty :D.
Now I want pastries …. Those pastries look yummy. One of the best things about holidays is eating. 🙂 Interesting stuff.